There were four SONYA class minesweepers ( tральщики проекта 1265 шифр «Яхонт») in the Bulgarian Navy. Last edited by MUGUR on Sun Mar 26, 2017 9:50 am, edited 2 times in total. I love those small and multipurpose ships, so I built some Chinese type 6610 (Russian name Project 254M and NATO code T-43 class) minesweepers. I'm looking towards my next project and I have the Niko model, YMS-419 in the stash that I'd like to do next however I've found these images on Navsource and I need help indentifying the colours, any ideas? Could I be correct to think YMS-419 is in Measure 22? Last edited by Timmy C on Mon Dec 24, 2018 5:14 pm, edited 1 time in total. Navsource images do not display with [img] tags unless you've already viewed them on your computer. Leaving it as a link works. Yes, YMS-419 in 1945 is in measure 22. For a new ship in 1945 the grays are neutral grays. Reference is The Development of Naval Camouflage 1914 - 1945, Part V: United States Navy - World War II by Alan Raven. #27 neutral gray is the medium gray above the hull horizontal band above to the lowest point of the sheer line. #7 neutral gray is the hull dark gray horizontal band. In the US both are available from H & B Hobbies. Last edited by Michael Potter on Wed Dec 26, 2018 7:10 pm, edited 1 time in total. Internut seems to redirect the links you posted. Thanks, good catch. I've edited that post to correct the links and to show them as plain URLs. Actually the images of YMS-419 on Navsource shows her in Ms 12. The demarcation line between dark and light grays (or blue-grays if they used existing stocks of paint) follows the sheer line of the main deck, not parallel to the waterline. The new camo measures issued in 1945 were ... http://www.researcheratlarge.com/Ships/ ... ation.html ... This application doesn't follow the new rules for Ms 12 (1945) or Ms 22 to be horizontal to the waterline, but does reflect the old Ms 12 design. Several destroyers were painted to the same "follow the main deck sheer line". The YMS-419 scheme does follow the Raven rules for Ms 18 used on several destroyers in 1942-44. 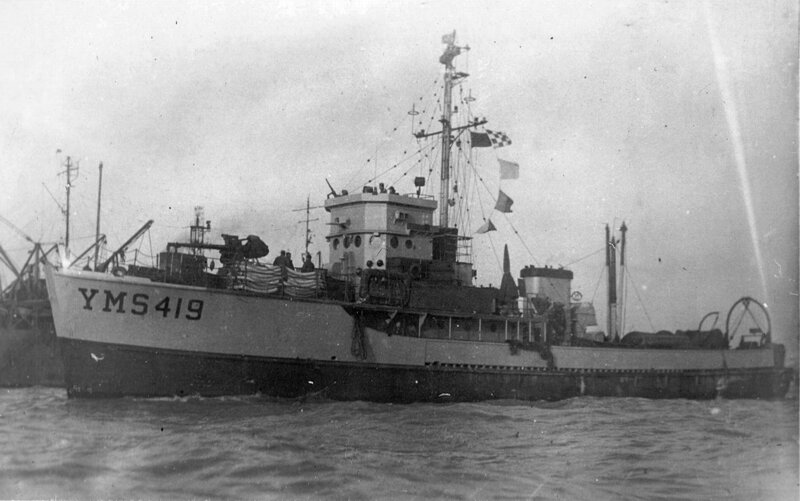 YMS-419 was commissioned on 18 November 1944, before the neutral grays were available. But, she may have been repainted after being delivered. According to her DANFS entry, she didn't depart from the West Coast for operations off Japan until September 1945. The second Mockingbird (AMS‑27) was laid down as YMS‑419 17 September 1943 by Henry C. Grebe & Co., Chicago, III. ; launched 23 March 1944; and commissioned 18 November 1944. Following her shakedown and training period, YMS‑419 was assigned to duty in the western Pacific. She departed San Pedro, Calif., 27 August 1945 and on 27 October began minesweeping operations off occupied Japan. Until the spring of 1946 she swept shipping channels in the Far East, first off Honshu, then between Kyushu and Korea, and finally around the approaches to the Yangtze River. She then returned to the United States for an extended stay, during which she was redesignated AMS‑27 and named Mockingbird 18 February 1947. The DANFS entry for USS SPRIG (AM-384), doesn't have her departing the West Coast until 6 October 1945, after YMS-419 had already departed. USS SPRIG didn't start operations in Japanese waters until late in November 1945. 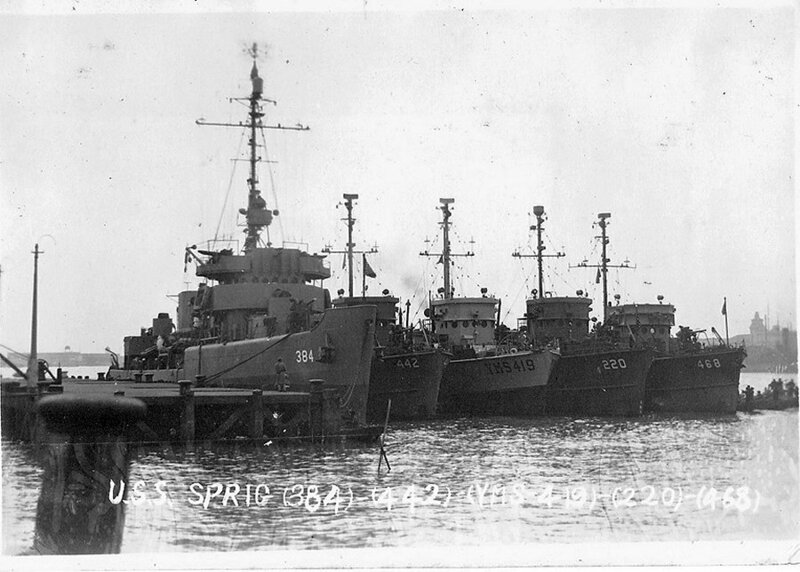 Therefore the photo of YMS-419 and USS SPRIG together dates from late November 1945 or afterwards. Sprig (AM-384) was laid down on 15 February 1944 by the American Shipbuilding Co. at Lorain, Ohio; launched on 15 September 1944; sponsored by Miss Carol Pitrie; and commissioned on 4 April 1945, Lt. Thomas W. Cross in command. On 15 April, the minesweeper started down the St. Lawrence waterway from Cleveland, Ohio. After stops at Montreal, Quebec, and Halifax, she arrived at Boston on 5 May. There she executed her first mine-sweeping trials and had her sound gear and depth charge equipment removed. She put to sea on 16 July and reached Hampton Roads, Va., the next day. Sprig conducted shakedown training at Little Creek until 6 September when she got underway for the Pacific. She was in the Canal Zone from 12 to 14 September; then headed via Acapulco, Mexico, to San Pedro, Calif., arriving there on the 24th. After almost two weeks on the west coast, Sprig continued west on 6 October and made Pearl Harbor on the 20th. On the 31st, she sailed from Pearl Harbor bound for the western Pacific. She stopped briefly at Eniwetok and Saipan and made Wakayama, Japan, on 28 November. For the next five months, Sprig participated in the major minesweeping operation conducted in the immediate postwar period. In December 1945, she swept mines in the Tsushima Strait. She conducted minesweeping practice and sweeping operations at Tachibana Wan, Kyushu, in January 1946. Sprig moved to Shanghai, China, in February and returned to Sasebo, Japan, on 2 March. Later that month, the minesweeper began duty as courier ship, carrying mail and supplies to United States ships on station in the waters between Japan and Korea. In April, she herself took up one such station, relieving Champion (AM-314), then Murrelet (AM-372) later in the month. Her commanding officer served as CTU 96.6.3 until 26 April, supervising minesweeping operations at Saishu To, off the southern coast of Korea. On the 26th, she headed back to Sasebo and, on 1 May, got underway to return to the United States. She stopped at Pearl Harbor from 17 to 25 May and made San Pedro, Calif., on the 31st. On 7 June, she sailed south toward the Panama Canal as OTC of a unit composed of PCE-843, YMS-430, and YMS-U2. She transited the canal and departed Coco Solo, C.Z., on 20 June. On the 27th, she entered Charleston, S.C., and reported for duty to the Commander, Mine Force, Atlantic Fleet (COMINLANT). For the next eight years, Sprig served COMINLANT, sailing the length of the Atlantic seaboard and into the Caribbean at times. During this period, she was home ported at Charleston, S.C. In June 1954, Sprig was decommissioned and placed in reserve at Orange, Tex. On 7 February 1955, Sprig was reclassified a fleet minesweeper, MSF-384. After 18 years with the Atlantic Reserve Fleet, Sprig's name was struck from the Navy list on 1 July 1972. Her hulk was sold on 20 December 1973 to Southern Scrap Material Co., Ltd., of New Orleans, La., for scrapping. Guy’s thanks for your replies. What I get from this is that YMS-419 was in Ms12 (1945) in the neutral grays (probably).